Kanye West officially has a fundraising committee behind his 2020 presidential run, which the Chicago rapper declared Sunday night during the MTV Video Music Awards. A man in Maryland filed the "Ready for Kanye" PAC with the Federal Election Commission Monday. Eugene Craig III, who filed the PAC, is listed as both the custodian or records and the treasurer. Although the committee was made official with the FEC filing, it's entirely possible the fundraising campaign was created in jest, just as Deez Nuts and a Labrador from the Chicago suburbs officially launched presidential campaigns with their FEC filings. Craig, however, told the Washington Post that he would "absolutely encourage (West) to run" in 2020 if there wasn't an incumbent Republican president. "I think he will bring an interesting dialogue to our party, and he'll find a lot of people who want that dialogue," Craig told the Washington Post. "He's pointed out the crippling racial disparities in the law and the economy. He's talked about the pipeline of private prisons. He's a genuine entrepreneur. Oh, not to mention that his first big single was 'Jesus Walks.'" According to the Washington Post, Craig is a 24-year-old African-American Republican activist from Maryland, who runs the Young Minority Republicans Fund. 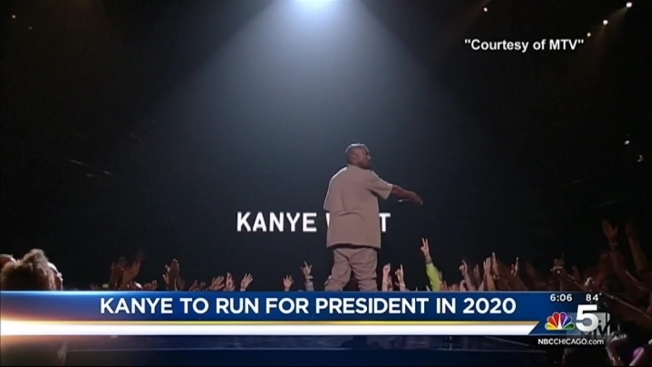 A Facebook page created for the "Ready for Kanye" PAC shows t-shirts that say "Kanye 2020" and "Kanye West '20" and a description that asks voters to "like" the page to "show the world we are ready for President West!" In a rambling speech during the MTV Music Video Awards, West admitted he got high before entering the stage, where he apologized to Taylor Swift for taking her microphone in 2009 and claimed he would run for president in 2020.